The Christian family aims to create Saints, who will in turn work in schools, construction, agriculture, shipping and so forth, transforming all of society as much as they can. That is why, as St. John Chrysostom teaches us, Christian parents should first consider how they will raise their children according to the instruction and counsel of Christ, and only afterward how they will secure for them the necessary material and spiritual resources for their lives. 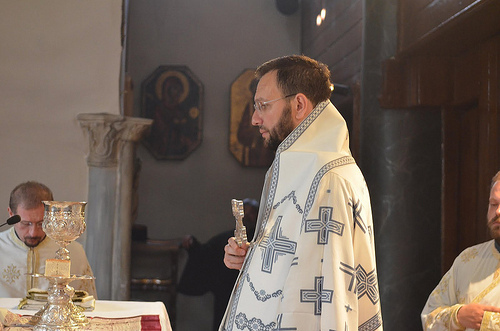 The following excerpt is taken from an address by His Eminence Metropolitan Stefanos of Kallioupolis and Madytos on behalf of His All-Holiness Ecumenical Patriarch Bartholomew to the Clergy-Laity Congress of the Holy Archdiocese of America on July 9, 2014. The theme of this year’s Clergy-Laity Congress, “The Orthodox Christian Family,” inspired by the Epistle of St. Paul to the Ephesians, provides me with the opportunity to share some simple thoughts with you. First of all, in speaking of the family, and particularly the Christian family, we mean the union of a man and a woman, who receive the blessing of the Church, through faith in God, love, peace, harmony and mutual understanding, to live together. As stated by His All-Holiness our Patriarch in his Christmas Encyclical last year: The institution of the Christian family constitutes the cell of life and an incubator for the spiritual and physical health and development of children. Therefore, the manifold support of the institution of the family comprises the obligation of the Church . . . In order for a child to be raised in a healthy and natural way, there must be a family where man and woman live in harmony as one body, one flesh, and one soul, submitting to one another. 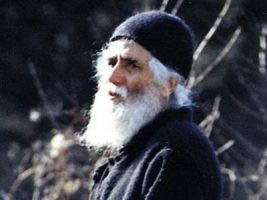 This is why, as a contemporary theologian (Prof. Alexandros Stavropoulos) observes, the phrase “and the two shall become one flesh” (that is, the two spouses will become one flesh) means, before Christ, the physical union of the spouses; after Christ, however, “one flesh” is realized when man and woman participate in the Sacrament of the Holy Eucharist, the Sacrament of the Church. It is only in this eucharistic context of the sacred institution of matrimony that the teaching of the Church about monogamy and the one, indissoluble marriage can be understood. In addition to this, I would like to mention briefly the attributes of the Christian family, which is characterized by the Apostle Paul as “κατ’ οἶκον ἐκκλησία”, that is to say a church in the home, and by St. John Chrysostom as a “small church”. The comparison and symbolism indicate that the characteristics defining the Church must be present on a small scale in the family as well. The fundamental characteristics of the Church are unity, holiness, catholicity and apostolicity, just as we recite at the end of the Creed, the Symbol of Faith: “In one, holy, catholic and apostolic Church.” So let us consider how these characteristics apply to the Christian family. 1. The Church is one, which is why the spouses are called to an indissoluble, lifelong, ontological union. This union is the great Sacrament of Matrimony, of which the Apostle Paul speaks to us. Two people come together undivided, without however being confused. They overcome all separation and division – biological, social, or individual – and compose their own personal community. All the problems and differences that exist in the family are immediately resolved once the spouses consider the consequences that arise from the theological dogma of the unity of the Christian family, which participates in the sacrament of the Holy Eucharist and thereby acquires a unity that is real and sacramental, transcending rational conception and not merely carnal. 2. The Church is holy, which is why the family must be holy, that is, devoted to God. In the betrothal as well as the marriage services, the Church prays for perfect love, peace, blameless manner and way of life. This is done in order for the future couple to understand that the aim of the family, founded at the Sacrament of Marriage, is the sanctification of the spouses and their children. Moreover, the Church prays to God to grant the new couple long‑lived offspring, fruit of the womb, fertility to produce virtuous children, and the opportunity for the enjoyment of fair offspring. The Christian family aims to create Saints, who will in turn work in schools, construction, agriculture, shipping and so forth, transforming all of society as much as they can. That is why, as St. John Chrysostom teaches us, Christian parents should first consider how they will raise their children according to the instruction and counsel of Christ, and only afterward how they will secure for them the necessary material and spiritual resources for their lives. 3. The Church is catholic, which is why it grows not only qualitatively but quantitatively. This means that the Christian family must acquire new members. It should strive to be a microcosm, which would not avoid sacrificial love and absolute self-offering to its members. 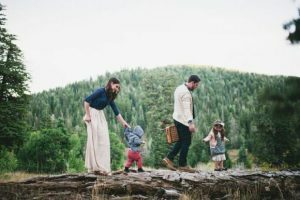 People today often ignore sacrificial love, and that is why they are also unaware of what fatherhood and motherhood are in their real dimensions: namely, the offering of ourselves for the sake of others. Nobody has the right to refuse the gift of life. The birth of a child is the sacred gift of co-creation between God and humans, a unique transmission of life to others, a “great entrance” into the communion of love with God and our fellow human beings. 4. The Church is apostolic, because its eternal and immutable foundations are the teachings of the Apostles. At the same time, this means that the Church always has the zeal, passion, and the desire of the Apostles to spread the message of the Gospel everywhere. These characteristics of the Church must also characterize the Christian family. We have vivid examples from the New Testament: for example, Aquila and Priscilla, and the family of Stephanas. In his Epistle to the Romans, the Apostle Paul praises this holy couple, presenting them as his fellow-workers-in-Christ in Corinth, in Ephesus and in their own city, Rome, where they made it possible for the Apostle to the Nations to visit the Eternal City. In his first letter to the Corinthians, St. Paul also speaks of the family of Stephanas. This entire family believed in Christ and spread Christianity in Achaea. Afterward, they set their sights on spreading the Gospel even further. Thus, their contribution brought encouragement not only to Paul but also to the Corinthians. The apostolic characterization of the Christian family means that it acts, operates and breathes within the climate and of the missionary mindset. Bearing in mind today’s family, I feel that what we need is not the creation of a religious family but of a Christian family. Today, we do not just have a crisis of the family, but a crisis of the Christian family. In order to remedy the situation, the family should systematically and urgently study the evangelical and patristic teachings. It should exemplify the biblical model of the family and the richness of our ecclesiastical tradition, while at the same time living the sacramental life of the Church. Only then will we truly see one, holy, catholic and apostolic family.